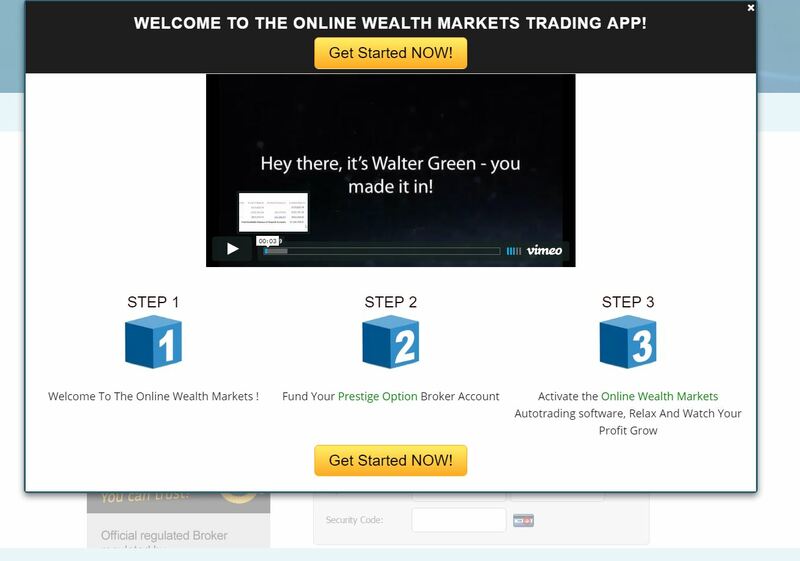 In this Online Wealth Markets review we prove that it is a binary options scam. It is presented on Finance Reports. Finance Reports published an article about Matthew Hicks from London who allegedly is now making 5,000 to 6,000 euros per month thanks to trading with Online Wealth Markets. Online Wealth Markets is a binary options trading system. And you can of course get it for free, because getting money is free, right? First let’s start with Finance Reports. It tries to look like a media web page, but in fact it is just a funnel to prepare you for signing up. The story is completely bogus, there is no Matthew Hicks earning money in binary options trading. You can try to click any links at the Finance Reports web page and you’ll see that they all are affiliate links that lead to one single place. This is not a real media web site, there are no other articles, the menu on the top is fake. We could prove all this in our own way, but it is easier to pinpoint you to the Terms and Condition of Finance reports. Have a look at the image above, they admit their story is fiction, they completely made it up. Why? To make you believe that Online Wealth Markets is a profitable trading system. So you believed in the story on Finance Reports and ended up on the Online Wealth Markets web page. What is this system about? It is a crappy piece of losing software designed to make you deposit money with Prestige Option. Why? Because if you do it, people who sent you there will earn an affiliate commission from the broker. 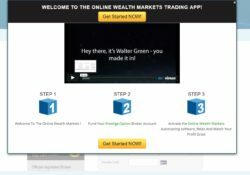 If you then trade your account with the Online Wealth Markets app, you will lose money. They won’t let you try the software unless you deposit money with their broker. So no chance to verify its performance. They know very well why they can’t let you do it. By the way their testimonials are of course fake too, have a look at the second picture, they used stock photos. We can conclude this Online Wealth Markets review by saying that it is a scam supported by Finance Reports. If you don’t want to lose money, stay away from this system. It doesn’t mean you cannot make money with binary options, you can. They are pretty easy to understand, but you still need a profitable strategy to succeed. You can try them on a free demo account. There you will see what kind of results you are able to achieve in trading.